After battling frigid winter temperatures and seemingly unrelenting April showers, seafood season has finally arrived, blazing a trail of sunshine, crisp freshness and briny smiles. Long Islanders love seafood. Drive long enough in any direction on this island and you will find seafood eateries just waiting to be shucked. 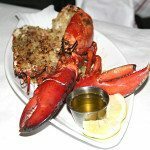 Seafood restaurants populate the map of Long Island like barnacles on the hull of a ship and come in all levels of style and price. 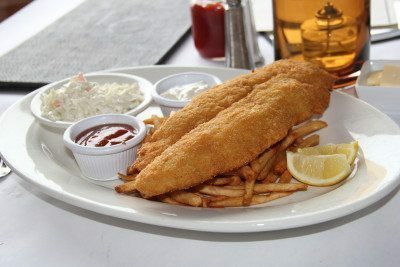 Residents have hundreds of restaurants on the island to choose from, but here’s a haul of seven seafood destinations to reel in as summer quickly approaches. A relatively new addition to Merrick’s Open Bay Marina, Anchor Down is owned and operated by its head chef, Stephen Rosenbluth, who also happens to be a former Montauk fisherman. 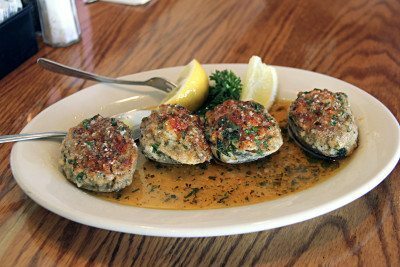 All of the seafood favorites are well-represented, including an oyster selection, littleneck clams (half shell, steamed or baked), jumbo lump crab cake and mussels. But check out Anchor Down’s blackboard for daily specials—this is where Rosenbluth’s skills as a seasoned chef truly crest. The Oysters Rockefeller are a velvety revelation and will make the eater take the oyster and cheese combination as gospel. 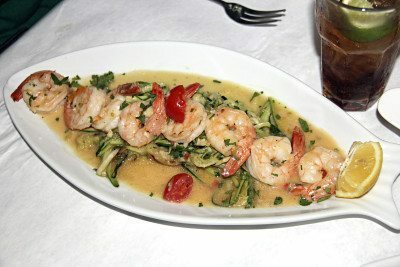 For the main course, try the sautéed shrimp off the everyday menu, served in a lemon butter sauce over zucchini pasta. 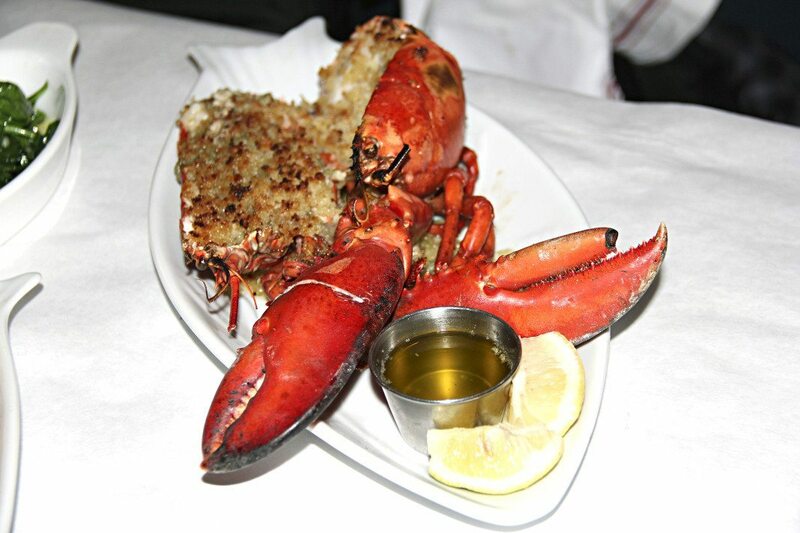 And back to the blackboard, order Anchor Down’s Lobster Tracey—a succulent lobster stuffed with breadcrumbs mixed with Parmesan cheese, garlic, oregano, olive oil, salt and pepper. Be sure to wear a lobster bib and take care to warn those around you about possible lobster shrapnel. But remember: if you didn’t make a mess, then you didn’t eat your lobster correctly. 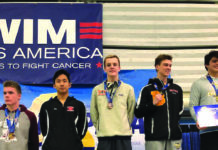 Freeport’s famed Nautical Mile has endured numerous changes through the years—perpetrated by both man and Mother Nature. The stretch has morphed into a thumping club scene with an atmosphere that caters to the bar-hopping denizens of Long Island. But before the paradigm shifted, the Nautical Mile was dotted with cozy restaurants, work boats and open-air bars that offered a far more “no frills” environment. One stronghold from those bygone days on the mile remains—Woodcleft Crab Shack, established in 1978. The Drosinos family has operated the eatery since day one and their commitment to quality has made Crab Shack the Mile’s most endearing spot. 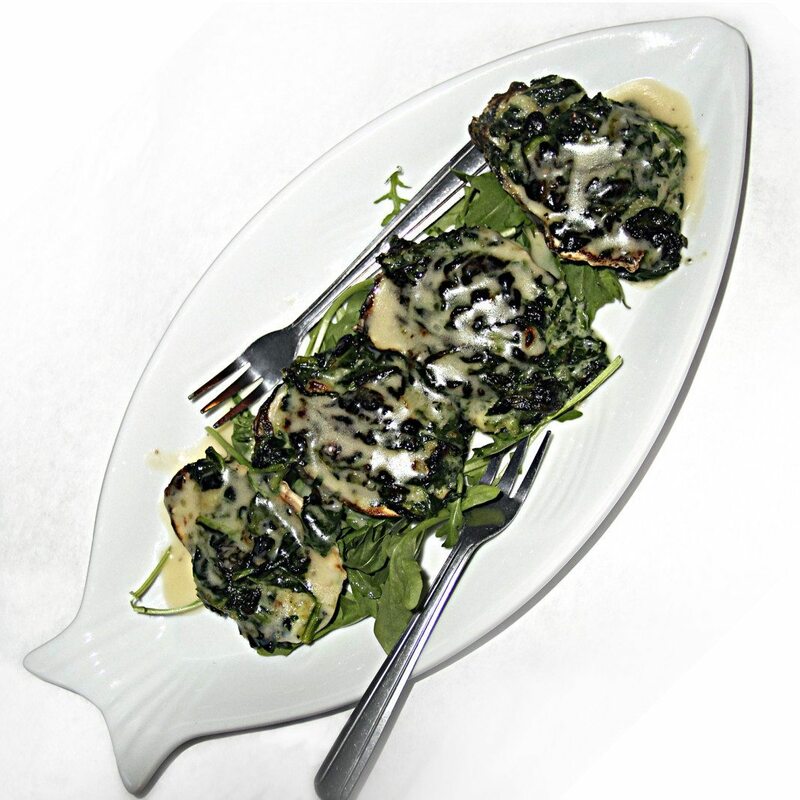 The must-order dishes include the baked clams, grilled calamari salad and the Zupa di Mare (red or white). 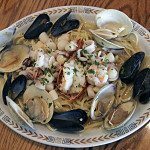 The Zupa di Mare is a belly-filling pasta dish with shrimp, scallops, calamari, clams and mussels, with the option of adding a lobster tail. The Crab Shack warms the heart while it satisfies the hunger—and don’t forget the garlic bread. With a view of the Long Beach Bridge, Jordan Lobster Farms, run by owner Steve Jordan, is a relaxed seaside spot serving fresh seafood. During the summer months, people line up around the corner for a turn at Jordan’s take-out window, where the restaurant doles out orders of oysters, clams, shrimp, crab cakes, lobster rolls and whole lobsters. 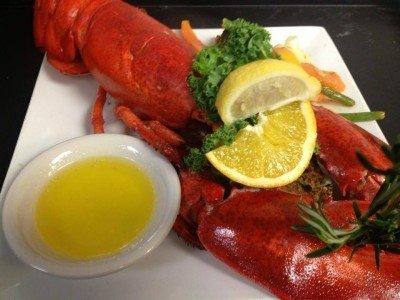 And luscious lobster meat is where Jordan’s truly shines. The restaurant receives daily deliveries of these clawed beauties, never farm-raised, but wild-caught in Maine and Canada. Jordan’s boasts some of the largest lobster specimens ever seen, with some of these mammoth monsters clocking in at around 15 pounds. 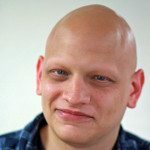 The knowledgeable staff wear shirts that read “Lobstertrician” for a reason—each member of the friendly staff is teeming with lobster insight and will gladly deliver their wisdom to any customer. Fisherman’s Catch sits in the seaside community of Point Lookout, nestled on a block of residential homes. Walking into the restaurant, a long dimly lit hallway gives way to a bright dining room and a wall of windows that offers waterside views for a perfect seafood setting. Staring at a seagull floating in the breeze while one slurps fresh clams and oysters on the half shell, is perhaps the truest representation of summertime. A great way to start a meal at Fisherman’s is with the sautéed Maryland crab cakes. 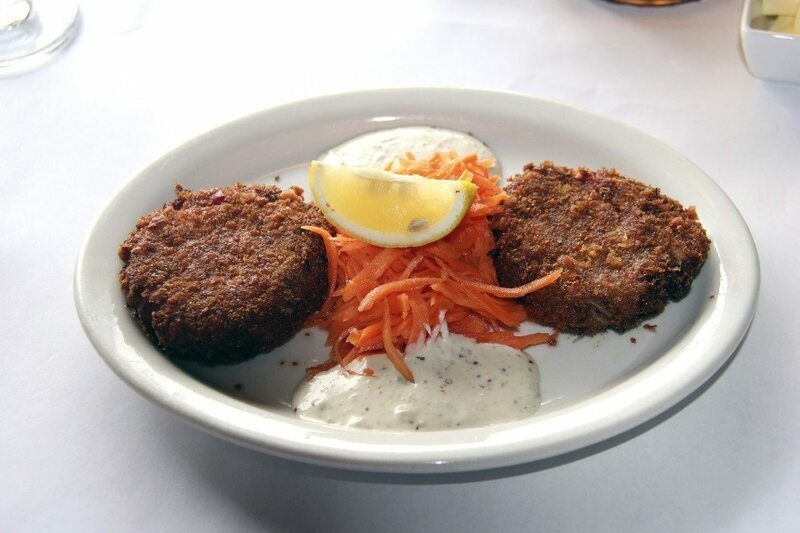 Served with carrot and ginger slaw, the crab cakes are golden fried and loaded with crab meat. Plenty of restaurants over do it with the breadcrumbs in their crab cakes, but Fisherman’s Catch replaces breadcrumbs with more crab, ensuring each bite is a mouthful of crab. The lobster bisque is a favorite among regulars, as is the menu of fried favorites, which includes sweet and juicy catfish, a boatload of shrimp, sea scallops and a combination platter. These fried favorites are also served lightly blackened. 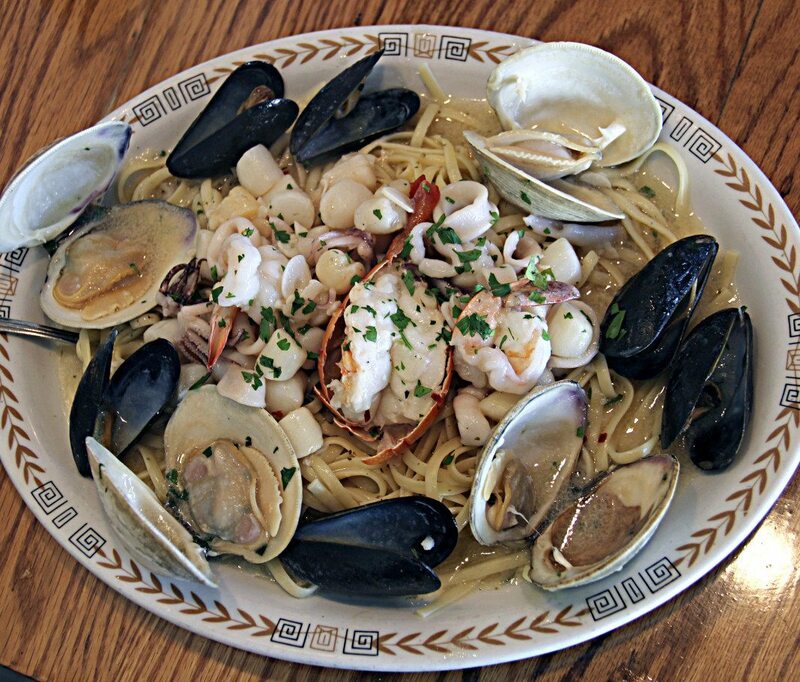 This no-frills clam bar in a little shopping center goes big on portions. All the seafood classics are here, but locals in the know come out on Friday and Saturday nights after 10 p.m. for the late night menu. Clams for 99 cents and clams on the half shell for 59 cents, along with lobsters and crab leg clusters specially priced, keep the restaurant filled through midnight. Special nights dot the rest of the week as well, including a clam bake on Mondays and all-you-can-eat Alaskan crab legs on Tuesdays. Go for super stuffed status on the I Can’t Believe I Ate The Whole Thing menu, with offerings including the customer favorite White Cloud, which is a heavenly combination of shrimp, scallops, sea legs and broccoli with rigatoni in a ricotta cheese cream sauce, topped with mozzarella. Pro-tip: with two days notice, Popei’s can get you any size lobster you desire, so dream big. The story of Bigelow’s in Rockville Centre started way back in 1939, when Russ Bigelow came to Rockville Centre from New England. An unpretentious paper-plate kind of place, Bigelow’s is the granddaddy of all seafood fry houses. 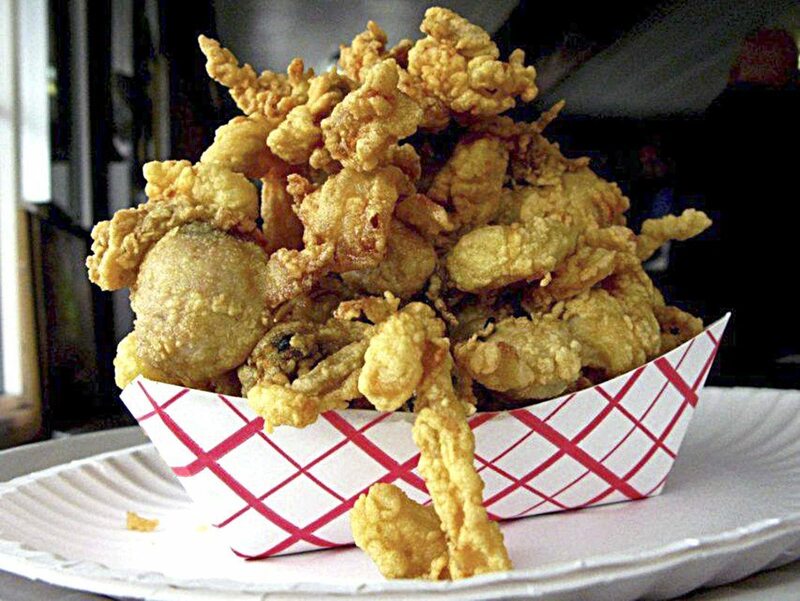 It’s signature item is the belly-and-all fried whole bivalves, Ipswich clams. Crisp, golden bites of comfort, the clams are the indisputable star of a fry menu that also offers oysters, whiting filet, Boston scrod, bay and deep sea scallops, shrimp, calamari, soft shell crabs and smelts. 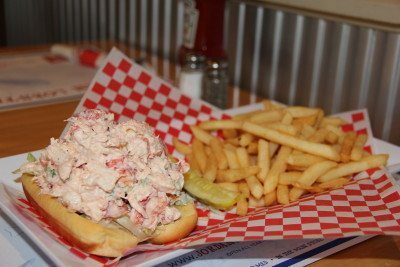 Beyond the fryer, Bigelow’s chowders are made using ocean-fresh ingredients, procured from the same vendor that Bigelow’s has been using since its inception. This venerable seafood spot is cash only, so belly up to the bar with enough green to eat like a king. Driving along Shore Road, one can’t help but feel that unmistakable craving for seafood. Maybe it’s the water view or the salty sea air—either way, make a right on Bayville Avenue and stop at the Crescent Beach Club, for it houses a spectacular restaurant/bar/lounge with innovative dishes and a seemingly unending panoramic view of the Long Island Sound. 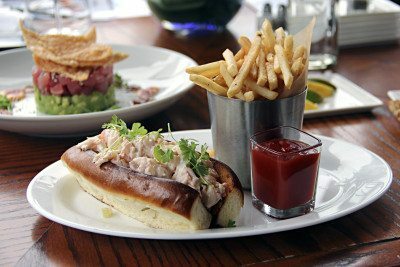 Ocean opened about three years ago and dining on the upstairs terrace is a rite of summer, as Bayville’s famous sunset views are elevated to even greater heights when viewed with a delectable lobster roll on your plate. The sweet and mouthwatering lobster meat is also found in the Ocean pasta, along with mussels, clams and shrimp with fettuccine in white truffle cream. Perhaps the most surprising draw to Ocean is its fantastic sushi selection. Local sushi hero Mr. Lee returns every summer with an intensely fresh selection of high-quality morsels. The quality of the fish is a taste to behold in the tuna tartar, with ahi tuna sitting atop an avocado puree and served with fried wantons. 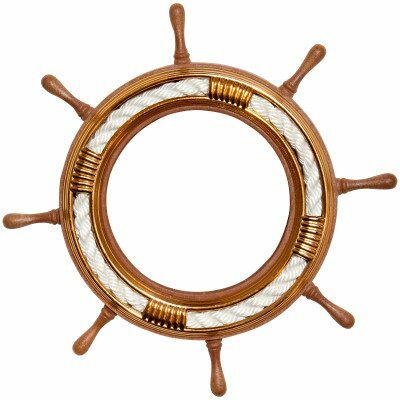 For an array of seafood tools, see Let’s Get Crackin’.